Phew….I’ve finally had a chance to recover from the weekend, and what a hectic weekend it was. As you may know, I was in Paris this weekend. What you may not know is that I was on a patriotic mission to represent the UK in Sarenza’s annual high heel race as part of the Fab Frocks on Foot team with fellow bloggers Tor from Fab Frocks and Amy from Wolf Whistle. So what exactly is the Sarenza high heel race?? 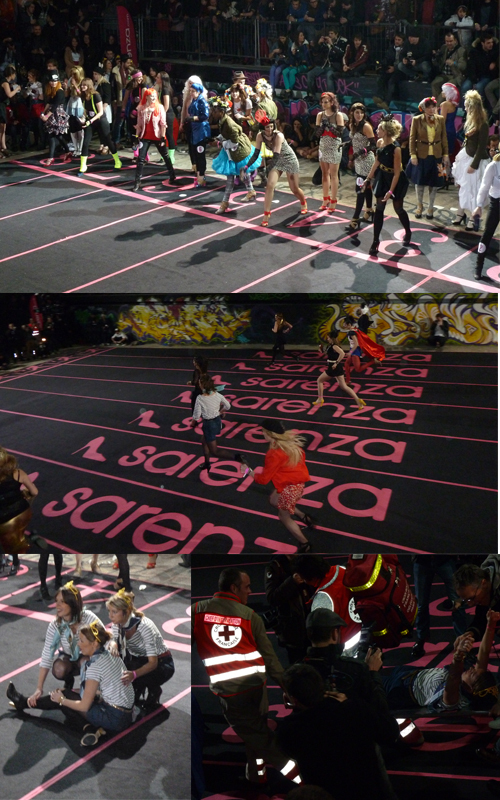 Well, Sarenza is a huge, huge shoe company in France and every year they hold an annual high heel relay race. If you’re lucky enough and quick enough to make it through the several heats, you will attend the grand final and be in with a chance of winning €3,000 of shoes! This year, 12 UK teams were battling 12 French teams, as you can imagine rivalry was high. To build on the rivalry, teams from each country were given a fancy dress theme. The theme for the UK was ‘English Eccentrics’ so we went for Alice in Wonderland. I must have written about the book and film a thousand times and the Natalia Vioidanova editorial in Vogue is one of my favourites of all time, so it seemed like a no brainer. 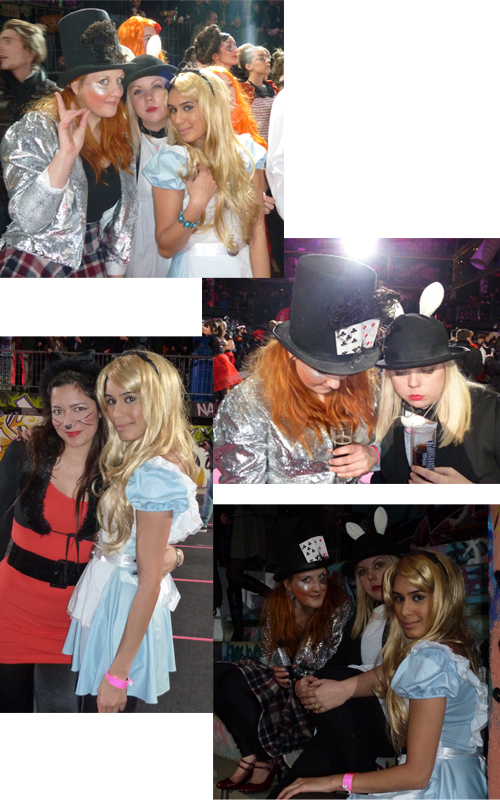 I decided to go as Alice, Tor dressed as the white rabbit, Amy went as the Mad Hatter and my plus one – the gorgeous Mariana from Sketchbook Mag – was our very own Cheshire Cat. 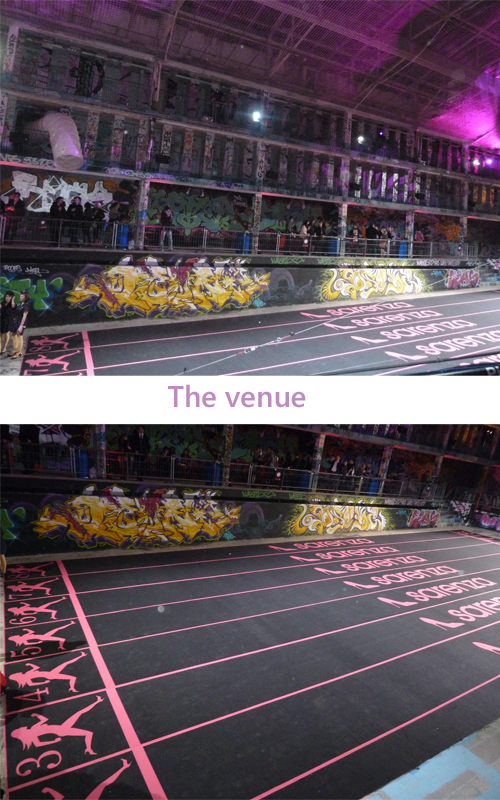 The event took place at the Piscine Molitor, as the name suggests it was an old swimming pool! We were told this was an incredibly cool location in Paris and I can understand why, it’s very industrial as pretty much everything is concrete but it’s covered in some amazing graffiti making it very contemporary and urban. The UK ladies didn’t really know what to expect but the French ladies took the competition extremely seriously – shoes were ducktaped on, warm ups were taking place and tactics were being discussed. There were so many journalists and press at the event, we soon realised that the high heel race actually makes national press in France! Before the anticipation starts building, we didn’t win. But I think we have a pretty good shot at the fancy dress prize which I think is more meaningful anyway?! I think we’re lucky to have gotten out of there relatively unscathed; there were lots of accidents including tumbles, falls and broken heels! 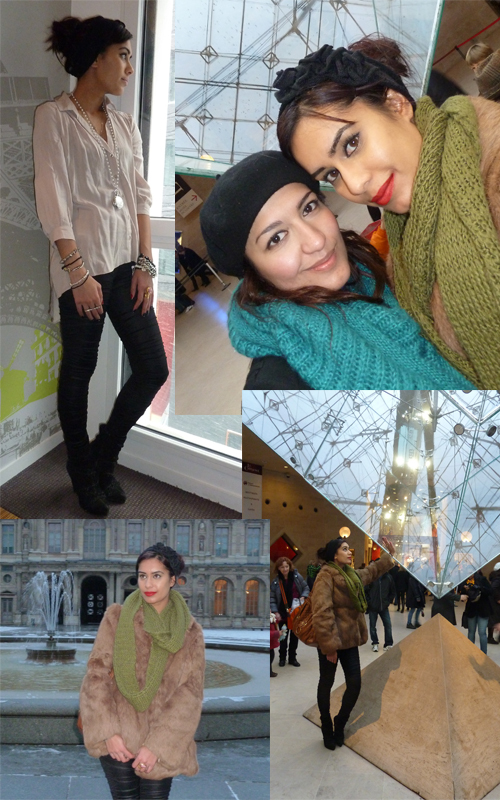 For the rest of the weekend we were free to do as we pleased so Mariana and I visited the Champs Elysees, the Arc de Triomphe and the Louvre. Thank you for a wonderful weekend, Sarenza! Huge thanks to Melissa and Camille from We Are Social for looking after us and making sure we were fed and watered. Such great pics, much better than mine!! Thanks for the mention lovely lady! Looks like you had a great time!! Did you end up strollig the marais?